Beware of companies where the actual name of the company has the words "organic" or "natural" in its title. For example, I could name my business Wild Prairie Organics or Wild Prairie Natural Body Care. Unfortunately, if you read the product ingredients they not organic or natural! A product label will read, “Made with 90% natural Ingredients.” The first ingredient on the label is water. The alleged natural ingredients are mostly the water and water is a natural ingredient. Unfortunately the remaining ingredients are synthetic. A product label will read, "made with all natural ingredients," or "made with organic ingredients." This leads the consumer to believe that the entire product is all natural or organic. Unfortunately, there is often just a small amount of truly all natural or organic material in the product. But technically the product is "made with" some small amount of all natural or organic ingredients so the claim is true, even though misleading. A product label will read, "made with 100% natural ingredients," or "made with 100% organic ingredients." The "100%" claim often refers to one or two ingredients, which are "100% natural," or "100% organic," even if other ingredients are synthetic. 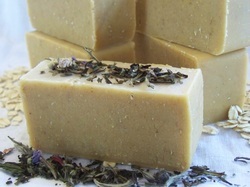 A product label will read, "scented with all natural lemongrass and sage essential oils." But does the manufacturer list all of their ingredients? Often times the natural essential oils are mixed with fragrance oils for a stronger scent. Read a product's label. If the ingredients includes the word "fragrance," "perfume," or "parfum," then it is synthetic and not-natural, even though the packaging may say "natural" soap. Question the words "safe synthetic." Who actually determined these synthetic ingredients were "safe"
Every day, people take baths or showers lathering up with commercial “soap.” Keep in mind, our skin is the body's largest organ and like a sponge, it will absorb chemicals. In fact, today many medicines are now given in "patch" form to be absorbed through the skin. What do you want to put on your skin?